In the mid-90s, one channel on my cable system showed infomercials 24/7. One of the infomercials most frequently aired on that channel was the one for “José Eber Secret Hair.” On this infomercial the fruity French hair stylist José Eber tried to sell hair pieces for women. They must have aired that thing five or six times a day! 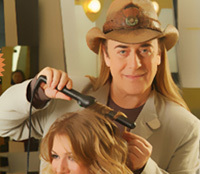 One of the funniest things about this infomercial was when José Eber introduced his “good friend Piny,” (pronounced “Pee-nee”) whom José described as one of the hottest hair stylists in Hollywood. The on-screen graphics listed the man’s name as only “Piny.” No last name (or maybe no first name) was given—so I guess Piny was like Cher (and probably liked Cher too). Recently, the tradition of infomercials hosted by effeminate hairdressers with foreign accents has been kept alive by Masood Max, who has worked as a hair stylist for the Shop at Home network (!) and hosts the infomercial for his Maxiglide hair straightening iron. Well, José wasn’t going to let his position as the king of limp-wristed foreigners on hair care infomercials get stolen from him! So José Eber now has a hair iron of his very own being sold on TV. Only in José’s case it’s a curling iron. (There was a website with video at JoseCurl.com, but it has been taken down for some reason.) So if you don’t like the straight hair you got from Masood Max’s Maxiglide, you can buy José Eber’s Crimpless Curling Iron and get your old hair style back! I think this video is also interesting because Yenz’s co-host is like a slightly less effeminate Bobby Trendy with a skunk patch. Take a look at this head shot of Yenz. Yenz makes Siegfried and Roy look like a couple of Teamsters. Will somebody please do a kind deed for the world and air this Yenz von Tilborg video as an infomercial on broadcast TV. Does Chaz Dean's Face Disturb You? Is that Chaz Dean getting his hair done in the picture to the right? Yenz is amazing. You are officially an idiot. Stop being prejudice because he is gay. You look stupid putting down someone else that has made it in life. My mom loved Jose Eber back when he was on TV all the time back in the 80s. I don’t think she knew he was gay, which is strange because she knew the kid that played Jonathan on Who’s The Boss was gay from the very first episode. @nicole And you are officially an idiot for standing up for a random dude who doesn’t care about you and saying he’s “made it in life”. Lol. @nicole shut the f*ck up you stupid, dirty b*tch. It’s not hatespeech if their right. You’re a f*cking dumb tw*t.